Handmade top in two different black jersey fabrics with colorful flowers. Long sleeves gathered at the wrist and low back neckline. Handmade top in supple teal blue jersey and black mesh for the sleeves. Long sleeves, and low back neckline. Limited edition. Handmade top in solid black cotton fabric and thin vintage black and pink floral jersey. Long sleeves gathered at the wrist and low back neckline. Limited edition. Handmade top in thin orange jersey and floral vintage jersey. Long sleeves gathered at the wrist and low back neckline. Limited edition. Handmade top in crimson red cotton jersey and thin striped jersey for the sleeves. Long sleeves, and low back neckline. Limited edition. 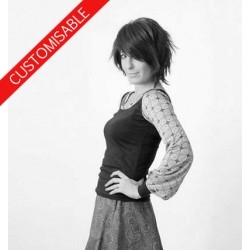 Handmade top in supple black jersey and white and black floral lace for the sleeves. Long sleeves, and low back neckline. Limited edition. Handmade women's top in beige and blue cat print jersey, and solid beige jersey. Long sleeves, and low back neckline. Limited edition. Pair of handmade fingerless gauntlets in vintage black metallic fabric, Fully lined in black. Women's tunic or short dress, handmade from stretchy crimson jersey with a bright blue geometric pattern and solid crimson red jersey at the top. 3/4 length sleeves. Limited edition. Handmade headband , from black stretchy gathered ruffles.